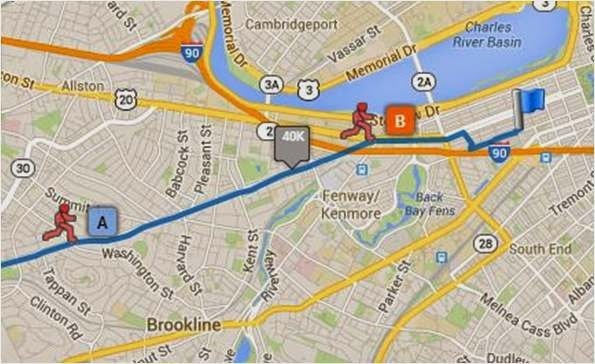 Yesterday was a big day for running, with the 118th Boston Marathon taking place (thankfully) without incident. Both SIOR and TPP's sister ran great races, and it was fun to watch their progress using the tracker on the BAA website. How perfect that Meb Keflezighi won the men's race. I'll never look at Skechers the same way again. I was disappointed when Shalane Flanagan dropped back after leading for so long, but she scored an American course record while finishing seventh overall. The marathon would have been great inspiration for a Monday run, but I held to my rest day to ensure I'd recover from Sunday's long distance. Speed work was on the calendar today, and since the schools are closed until tomorrow, I went over to the track to run intervals. I've done weekly speed workouts all throughout my half marathon training cycle, but I hadn't done a single set on the track until today. The temperature was 55° when I arrived at the high school. Although I was wearing shorts, I was concerned that having two top layers would cause me to overheat. With the 6 MPH wind, it felt chilly enough to keep them both on the entire time. The high school cross country team was assembled at the southern end of the track infield and I wondered if my workout would happen alongside a crowd of much faster runners. It turned out that I didn't need to share the track at all. The coach was having the team run laps barefoot on the grass, first slowly, then at speed. While that was happening, I started my workout with two laps around the track at around 8:50/mile followed by 6 x 400's at 8:00/mile. 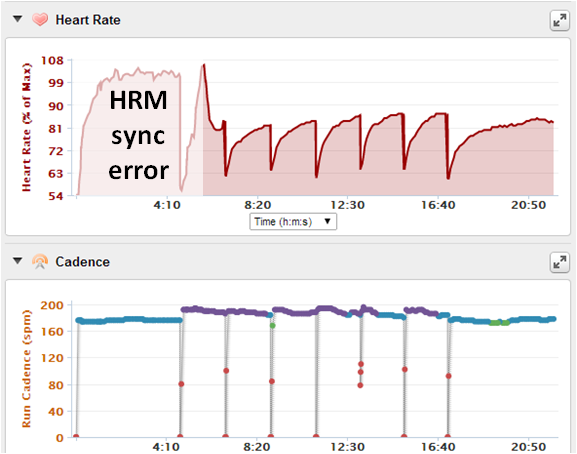 I finished with a half mile cool-down that I ran at a mid-9 pace. It was good tactical workout. I probably could have added another two quarters, but I wanted to keep it light today. I'll try to cover much more distance tomorrow. With the race on Sunday, I'm not sure what to do about my weekend long run. Nice speed! 8 minute miles! You are going to have a great race! Not sure if I will join you. My quads are super sore. How about running (jogging) a mile before the race to warm up and then tacking on the rest after? If not, I would just switch Saturday and Sunday. Adding miles after the race is a good idea, but I don't know if I'll have the time. What do you think about me running 10-11 miles easy on Saturday and then the 5K on Sunday? Too much? Don't worry about running Marcie. You should rest and enjoy a little recovery. Before you know it we're heading to Brooklyn! I think you'll be fine if you run 10 or 11 easy Saturday before your 5k Sunday.